N. Canon Dr. will be closed at Wilshire Blvd. to form a cul-de-sac on the north side of Wilshire Blvd. The closure will include replacing stop signs with a signalized intersection at N. Crescent Dr. and Clifton Way to better accommodate traffic. Metered parking will be maintained on both sides of N. Canon Dr. The closure will provide a consistent traffic pattern that will help mitigate the effects of construction activities on traffic. A sound wall on N. Canon Dr. will also be installed to provide sound and dust mitigation during construction. Anticipated April 2019. The closure will be in place for at least two years. How to Access N. Canon Dr. Westbound traffic on Wilshire Blvd. can turn right onto N. Crescent Dr., then left on Clifton Way. Eastbound traffic on Wilshire Blvd. 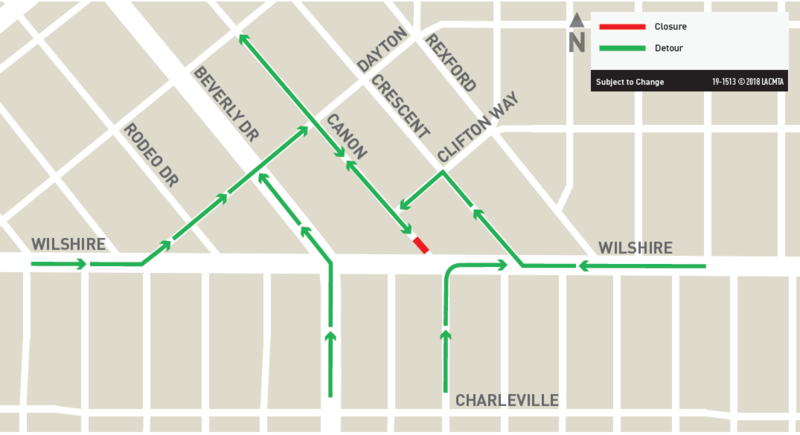 can use northbound Dayton Way, Rodeo Dr. or N. Beverly Dr., then right on Dayton Way. Through traffic on Wilshire Blvd. will be maintained. Advanced detour signage will be in place to notify drivers of alternate routes. An extensive feasibility study was conducted in advance of the closure, which identified striping and signal timing changes to improve traffic operations in the area.